Earn your degree – at the pace and price that’s right for you. FEMALE SPEAKER: We believe that everyone is a student, in different ways, on different days. From the mom who tucks in her kids then pulls out a textbook, to the entrepreneur who studies while others sleep on the plane. Today, learning happens all around us. And each new experience is a chance to grow. But if education is forced into the deadline's of traditional courses, we'll miss out on the opportunities for progress in between. So let's reward the research that happens at the coffee shop and recognize the science experiments that happens in the kitchen. And let's uncover all the things we didn't know that we know and collaborate, until they're more than we could imagine. Let's challenge ourselves to unlock our potential, one skill, one competency, and one milestone at a time, until learning fits into the rhythms of our lives and keeps us close to the ones we love. We're here to help you plan your own path, set your own goals, and achieve them your way. Because when education matches your tempo, learning never stops. Tempo Learning™ by Walden. Earn your degree on your terms. Tempo Learning by Walden University offers an innovative, custom-paced way to complete your degree in a way that fits your lifestyle. Our program lets you use your real-world work experience to potentially speed your progress, plus offers learnings that can be applied in your job immediately. Whether you’re a fast-paced learner or want more time to fully absorb your studies, our learning experience adapts to your style—not to a calendar. With no weekly deadlines, a mobile-optimized experience, access to content on demand, and online communication with faculty, you decide when and how you learn. A subscription-based model means you have a way to control your tuition cost. Your work experience may speed your progress, potentially saving you time and money. Tempo Learning is a competency-based education experience. That means your progress is measured by proving your knowledge, skills, and expertise through a variety of assessment opportunities. Competencies are skills, knowledge, and abilities that students use to demonstrate their progress. For each degree, a series of competencies that students need to be successful in their careers is identified. Students progress toward their degree by showing mastery of competencies through a variety of assessments, such as selected responses, short answers, or work products. As you move forward through competencies, you’ll be able to apply your work experience or previous education. Industry experience may allow you to accelerate progress, demonstrate mastery through assessments, and complete competencies. Plus, you’ll be gaining skills that you can immediately apply to your job while you are working toward your degree. As you master the skills and knowledge you need to move through competencies, you work toward your end goal at a speed that’s right for you. If you have a lot of time, you may be able to complete competencies at a rapid pace, or slow your progress to fit your life. You even have control over what you learn and when. For instance, if a particular competency syncs with an initiative at your workplace, you can choose to make that competency a priority. Tempo Learning provides an intuitive online learning experience to master your degree program’s competencies. So you can make the most of every minute, finding progress whenever it fits in your life. You might be studying at the kitchen table, at a coffee shop, or in a break room, but you’re always connected. Faculty members engage proactively in your learning and provide detailed feedback, sharing their expertise in every competency. Tempo Learning students also meet regularly with their Academic Coach throughout the life of their program, providing guidance and resources that help you set and reach your goals. The one constant in life is: Things change. Tempo Learning® allows you to make strong progress when you have time and bandwidth—and slow down when the realities of life take priority. Our platform lets you log in from any device, at any time, and it includes easy ways to plan, map, and track your progress. Since your degree competencies are based on real-world skills, you’ll be able to apply work experience when it syncs up with competencies. The benefit: leveraging your current knowledge to make progress in your program, potentially saving you time and money. Whether you have a 10-minute break at work or an extra half-hour after the kids go to bed, you can make progress on your phone, tablet, or computer, wherever you are. Competency-based learning means you decide your schedule. Create a personalized plan to reach your career and educational goals – at the pace that is right for you. Track your progress, or change your plan if life intervenes. Tempo Learning provides the flexibility you need to be successful. You're never alone with Tempo Learning. Expert Walden faculty, and your Academic Coach engage with you throughout the life of your program. Tempo Learning® by Walden University is a custom-paced learning experience that lets you earn your degree on your terms. Custom-paced education allows students to have more control over their schedule, apply their experience to their degree – and can even impact the length of time their degree takes and total cost of their program. Tempo Learning® programs are competency-based, meaning that your progress is measured by completing competencies instead of courses. Learn more about the differences between competency-based vs. course-based programs. Competencies are the skills, knowledge, and abilities a student needs to be successful in their chosen career field. In Tempo Learning®, students learn to demonstrate competencies instead of completing courses. This ensures that every graduate can show their current or future employer the specific skills and abilities they’ve learned in their Walden degree program. What is a competency assessment? Competency Assessments are how students demonstrate their achievement of a specific competency. Assessments can take many forms - work-based projects, short papers, planning documents - and usually mirror the type of work that you would create and apply on the job. 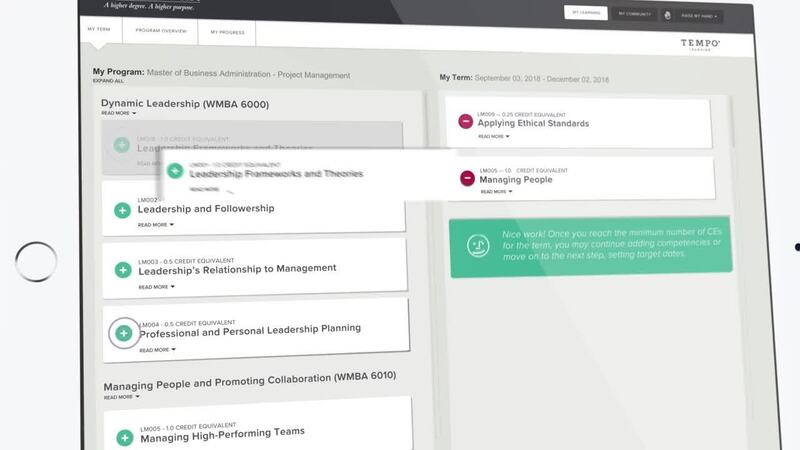 Within each competency are resources, knowledge checks and quizzes to help you learn new material or reinforce what you already know to make sure you're ready to attempt the assessment. In competency-based education, the goal is to demonstrate the specific competencies that you've learned. That's why you have multiple attempts to achieve each competency, with detailed feedback from faculty to help you along the way. Is a Tempo Learning® degree the same as a Walden University degree? Yes. At Walden University, several programs now offer two ways to learn – the traditional, course-based format or a competency-based format (offered in the Tempo Learning® platform). Walden University courses have been reorganized into competencies. The learning outcomes are the same regardless of which format is right for you, and you will graduate with a Walden University degree. What is it like to be a Tempo Learning® student? You’ve enrolled as a Tempo student – now what? As a new Tempo Learning® student, you will be introduced to your dedicated Academic Coach. During the first two weeks of your program, the Academic Coach will work hand in hand with you to create a customized learning plan that will help you achieve your goals. You will meet with your Coach regularly throughout your program to ensure that you have the information you need to be successful, from answering questions about the platform to helping you find resources. As you begin each new competency, you will be introduced to your faculty member who will engage with you to share their knowledge and expertise and provide feedback to ensure you’re learning what you need to be successful in the program as well as in your career. 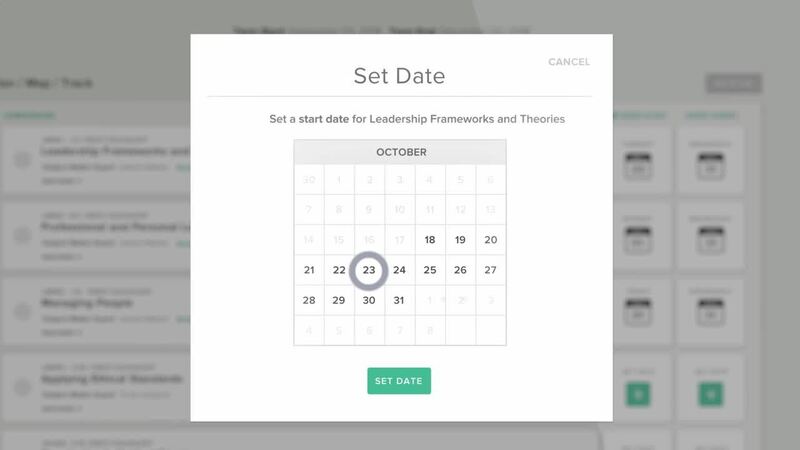 Tempo Learning® offers flexibility that fits your schedule - there are no set weekly deadlines. You have the ability to speed up or slow down as your time or knowledge allows. This means that you can complete as many competencies as you are able to within each 3-month subscription term. Further, you have control over what you learn, when. You can take competencies in almost any order and apply that knowledge right away. Need to prepare for a new project or endeavor? Skip to the competencies in your program that will give you the knowledge you need, when you need it. You can also use your real-life experience and prior knowledge to demonstrate what you already know through competency assessments. By applying what you already know, you can potentially accelerate progress to save time and money. Once you feel confident in your knowledge, you can attempt the competency assessment associated with each competency. You will have multiple attempts at each competency–the point is to demonstrate that you now understand skills or knowledge, not if you master the assessment on the first try. If you don’t achieve competency on the first attempt, you will receive prompt and detailed feedback from faculty, giving you pointers and guidance to support you along the way. You’ll continue to enroll in three-month subscription terms until you complete your program, meeting with your Academic Coach at the beginning of each term and regularly throughout. How much will my degree cost? The faster you learn, the less you pay. Tempo Learning® is priced as an all-you-can-learn model. That means instead of paying for courses or credit hours, you subscribe to three-month learning periods during which you can complete as many competencies as your skill, experience, and time allow. Visit each Tempo Learning program page (links below) to find the tuition for each program. How long will it take me to complete my program? Tempo Learning® is a custom-paced learning experience – that means that you can learn at the pace that is right for you. With no set weekly deadlines, you can speed up or slow down as your time or knowledge allows. Time to completion therefore varies for each student, based on their available time, experience, and personal goals - your enrollment advisor can give you an idea of how long a specific program may take you. How can my experience help me earn my degree? You can use your real-life experience and prior knowledge to demonstrate what you already know through competency assessments. By applying what you already know, you can accelerate progress to potentially save time and money. Are Tempo Learning® programs accredited? Accreditation is a mark of quality. Walden has been accredited by The Higher Learning Commission (HLC) since 1990. The HLC is one of the six regional accrediting associations recognized by the U.S. Department of Education and the Council for Higher Education Accreditation. In addition, many Tempo Learning programs have industry accreditation related to the program discipline or industry – you can find these highlighted on the specific degree pages. What degrees and programs are offered through Tempo Learning®? How to do I interact with faculty? Walden faculty members engage proactively in your learning, sharing their expertise to clarify concepts or provide additional information to ensure you gain the knowledge you need to impact your career. With each competency, you’ll work with experienced Walden faculty members who offer extended support and guidance on content and learning support tools, such as embedded resources, short quizzes, and knowledge checks. Though you have the ability to work independently and at your own pace, faculty are always easily accessible. My education at Walden has afforded me more opportunities for expanded responsibilities on the job. I like that if I was very knowledgeable about a certain topic, I could complete the competency more quickly, and if I needed to take my time on others, this was possible. Walden’s instructors are there to assist in your education. You are never alone in your journey. Being able to exercise, rehearse, and express my ideas regarding my passion in education has been a reflective process. I realized we should all aim to effect positive social change in our communities. If we leave a positive mark, then our job has been done well!